The other night my Mom took the kids out to dinner, and that got me off the hook for preparing a family meal, but my husband and I still needed to eat. I looked to my pantry and the internet for some quick dinner inspiration. I had fresh kale, white beans, canned tomatoes, and chicken broth. What could I make with those ingredients? The internet spat out two recipes. One from Martha Stewart. Too complicated. And the other recipe from Whole Foods. Bingo. 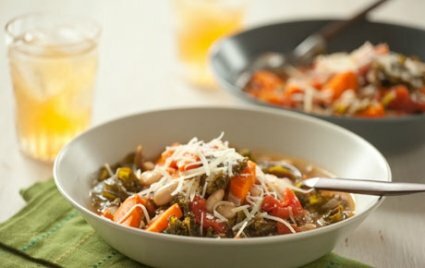 I scored, and I had everything I needed to make a Vegetarian Tuscan White Bean and Kale Soup. It's amazing that if you always keep beans, tomatoes, and chicken broth in your pantry, it can always help you out in a pinch. This soup is so easy and is ready very quickly. In fact, I put it together sharing the recipe on Periscope. It's long so my son edited it to give you the recipe part of the scope. You need the following ingredients and then you will have dinner on the table. olive oil, yellow onion, garlic, stewed tomatoes, chicken broth, fresh kale and carrots. The entire recipe and method for cooking are on the Whole Foods website. and in my video above.